Here are some incredible Easter floral decor pieces that are the perfect way to show off some festive fun while also elevating the look in your home. 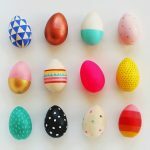 The Easter decorating pieces below are easy to make and will add the perfect amount of color to your room. 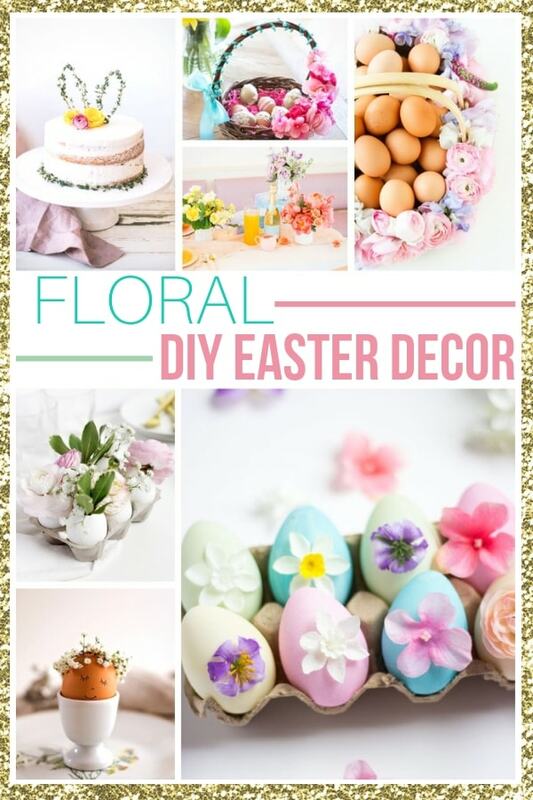 These fun projects range from mini floral Easter basket arrangments to egg terrariums for a rustic feel and all things in between. 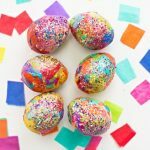 DIY Easter decorations are a great way to decorate your home, without overspending on decorations. You can either grab a bouquet at the grocery store, find some faux blooms at your favorite craft store or even just go foraging in your garden. Personally, whimsical and elegant Easter flower arrangement is what I tend to reach for in our home. Here are some amazing Easter decorating pieces that might fit your home style. This Floral Wreath Crowned Easter Eggs DIY is a wonderful way to great your guests at your dining table. This is a simple design that transforms the space in an elegant way. Flax and Twine did an amazing job coming up with a simplistic design that will add something unique to your Easter table display. If you enjoy pink and flowers, maybe consider this DIY Mini Floral Easter Baskets table decor. With a few wire vases and your favorite bundle of flowers, you can create a clean design. 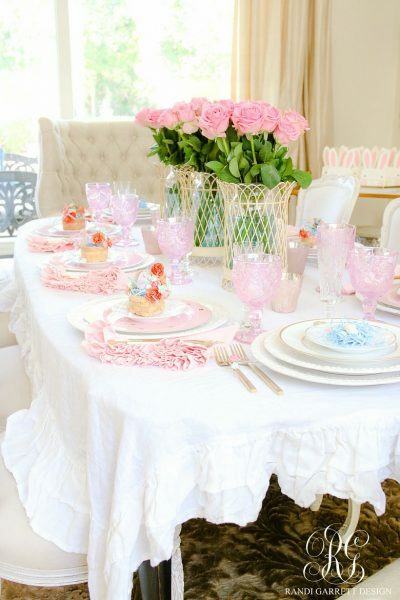 Randi Garrett Designs shares a stunning Easter themed table decor idea to consider. 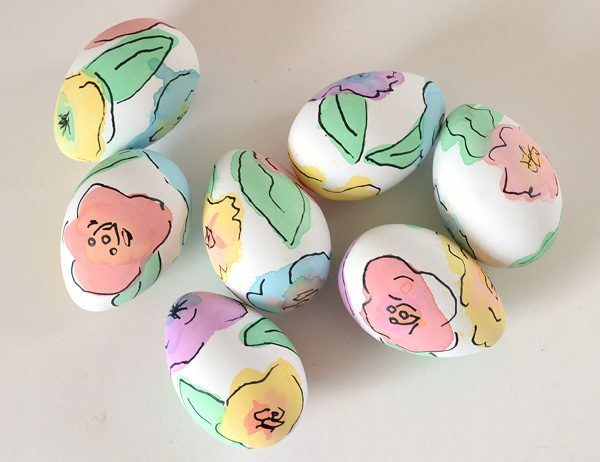 You can use flowers and even leaves to decorate Easter eggs! This tutorial will share with you how to Decorate An Easter Egg With Pressed Flowers. What is so unique about this look The Magic Onions created is no two eggs will look the same. 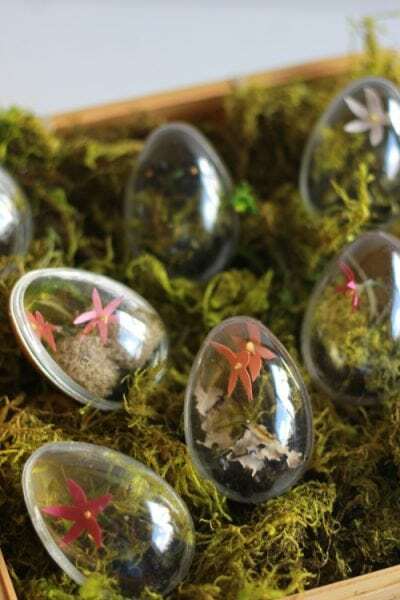 Learn How To Make Easter Egg Terrariums to give as gifts, or set out in a wooden box to add a pop of rustic Easter in your home decor. Or take these terrariums The House That Lars Built shares and place at each plate at the table for each guest to take home with them. DIY Easter Egg Floral Centerpiece is a simplistic take that will add the perfect amount of color to your table. 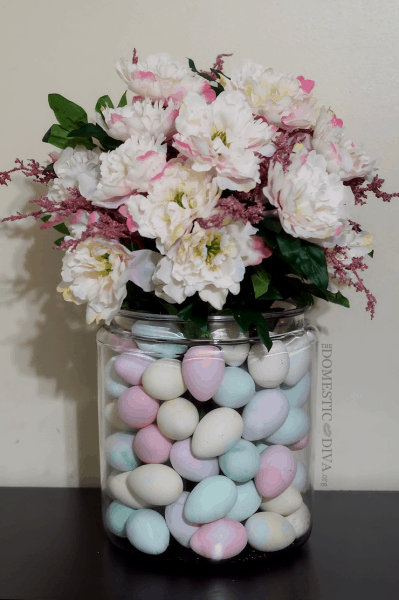 Lovely Indeed took a lot of thought into her egg floral centerpiece, from the ombre painted shells to the egg holder she placed those delicate eggshells in! Check out this DIY Floral Easter Baskets tutorial! A sweet way to dress up a wooden basket in a hurry. Set this out on a table to display or let your child wake up to a gorgeous basket full of goodies. 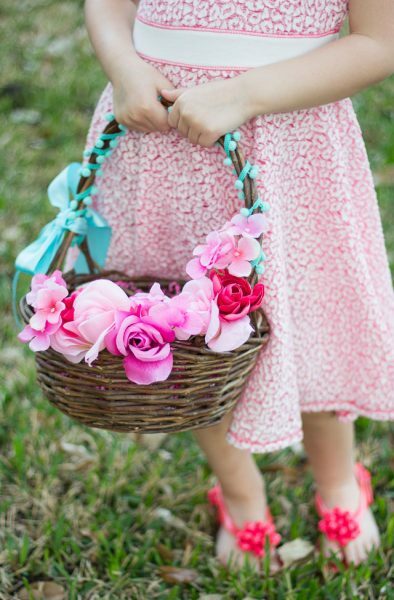 Design Improvised did an incredible job on this Easter DIY floral basket. Floral Eggs are absolutely stunning. Do this on hard-boiled eggs for an elegant flair, or buy some clay eggs to paint, and use year after year. Dream A Little Bigger created such a unique design here. 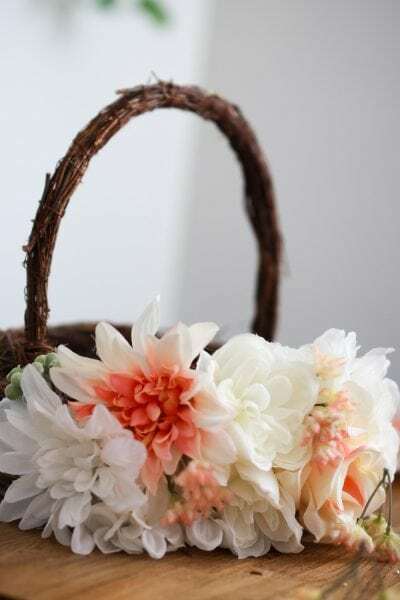 A Floral Easter Basket can really dress up your entryway table, dining table, or be an elegant Easter basket for the morning after the bunny arrives. Either way, Jets Cafe shares an incredible way to take silk flowers and a basket and make it into something fantastic. I am swooning over this DIY Floral Easter Egg Centerpiece. Grab your favorite bushy flowers and add them into some mason jars, to hide behind the eggs. 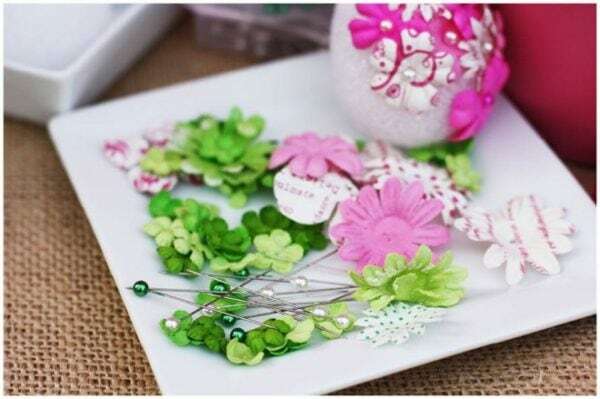 Craft Box Girls created such a quick and easy five-minute centerpiece that is gorgeous. 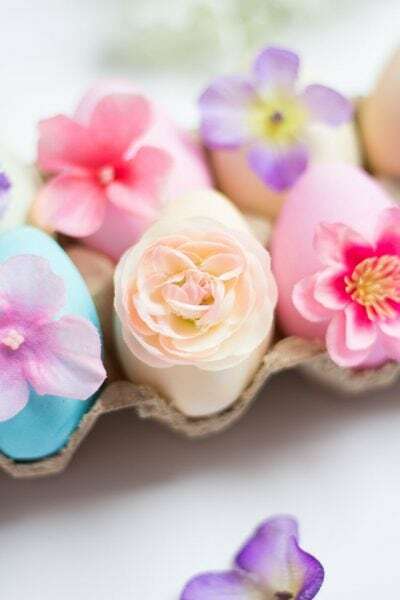 Grab a styrofoam shaped egg, and give it a makeover, with this DIY Flower Easter Eggs tutorial. You can create any color or design you want, gain inspiration from Pizzazzerie! You can use real or artificial flowers for this Easter Egg Floral Centerpiece Tutorial. With a few vases and eggs, you can make a lasting way to dress up your home in a classy way. Domestic Diva shares exactly how she made this centerpiece. Another centerpiece is this Egg Vase Centerpiece. 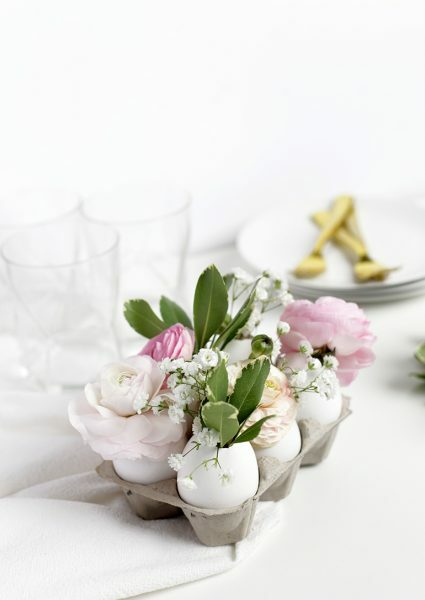 Here is another option for using eggshells as vases for flowers. The Merry Thought created a very stunning and simplistic design. Check out her tutorial. Love Hydrangeas? 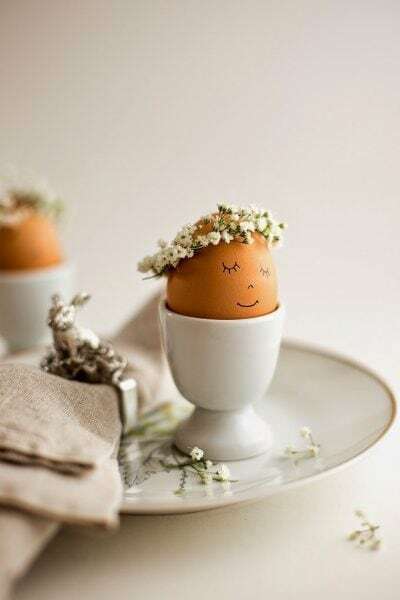 Here is a Hydrangea Eggs craft to add that simplistic egg decor piece. These also make fun gifts for loved ones. 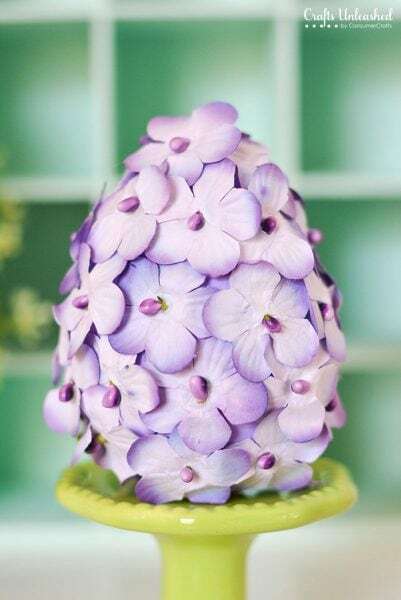 Consumer Crafts share exactly how they made this hydrangea egg! Five Minute Dollar Store DIY Spring Easter Wreath is a quick and easy craft to have finished to greet your guests! Best of all it doesn’t cost much to make. The Happy Housie did an incredible job on this Easter wreath. Making a cake this Easter? 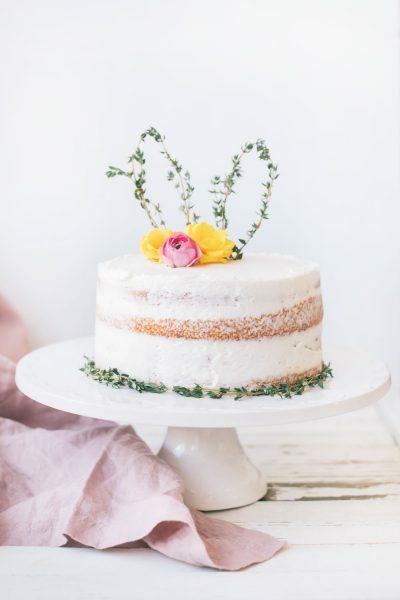 Here is a really Easy Easter DIY Thyme Bunny Ear Cake Topper! Look at how much this elevated an already stunning cake. 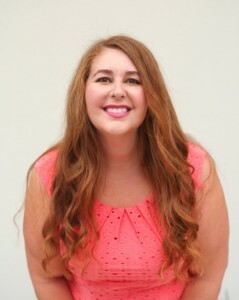 The Blondie Locks shares how she created this look! 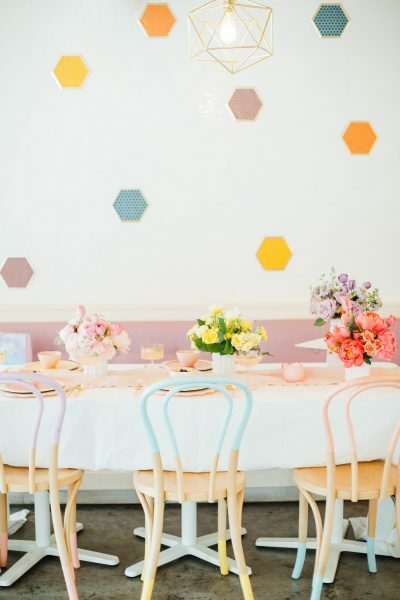 If pastel is your goal, you have to check out this Perfectly Pastel Easter Table Idea. Every time I see this picture my heart pitter patters at the sheer beauty. I love the mix of colors, it just elevates the room. Sugar and Cloth did a fantastic job on a simple but elegant table. 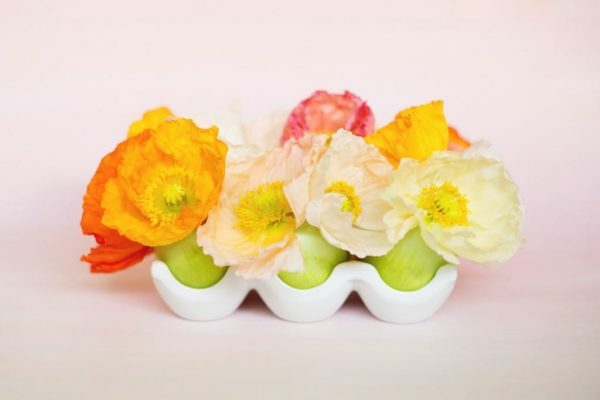 Gorgeous DIY Floral Easter Eggs make artificial flowers look good! Design Improvised took basic supplies and transformed them into a stunning display piece for your home, or gift to a loved one. Easter Picnic Basket With Fresh Flowers is just breathtaking. She filled it with eggs, to give it an Easter look. You could use this on Easter for a creative way to greet guests. Paper n Stitch has some incredible design ideas on her site. How adorable is this Curious Bunny Flower Pot Easter Decorations? 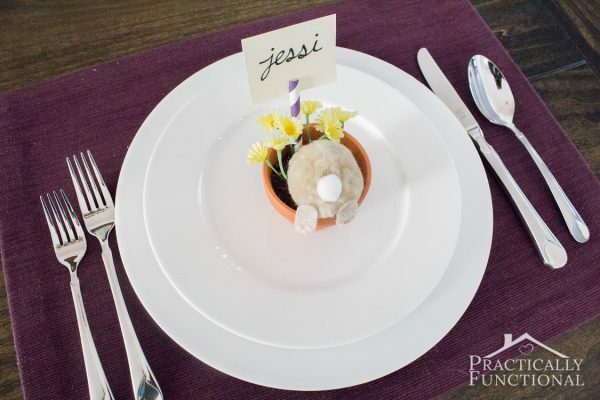 This is such a cute way to add name labels to each plate at your dinner table. Practically Functional had a wonderful idea she brought to life, to put a smile on everyone’s faces. What are some Easter decorating ideas for a table setting? Simplicity is key, I feel. You want a clean design that will offer a theme, but not overpower the table. I generally reach for flowers or even greenery to help dress up my table, but I also like to make sure my dishes and napkins are festive as well. 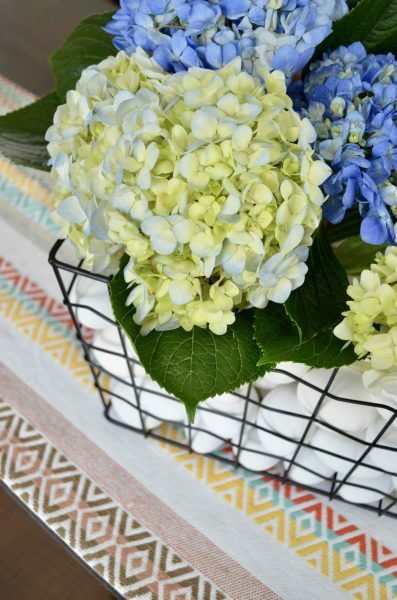 Grab some pastel plates, a fun table runner and some flowers…and you are set! As you can see from these Easter flower arrangements above, you have so many incredible options. Hot glue a flower onto a dyed Easter egg. 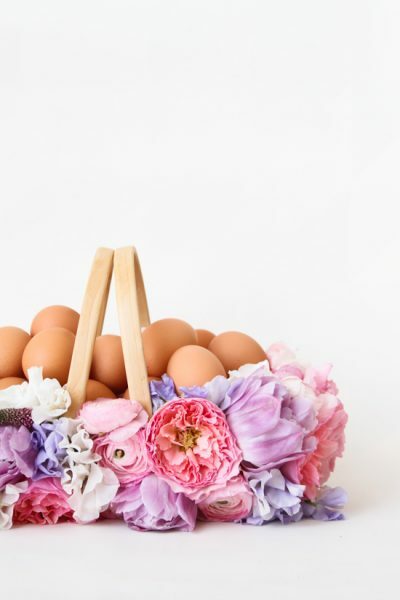 Secure fresh flowers onto a wooden basket and fill with eggs. 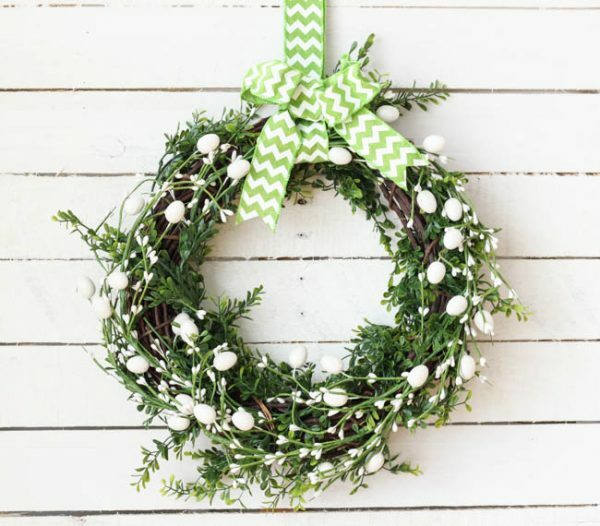 With a little greenery and a wooden wreath base, you can create a one-of-a-kind Easter wreath in minutes. Fill a vase with eggs and tuck in a flower arrangement in the center for a simplistic design. 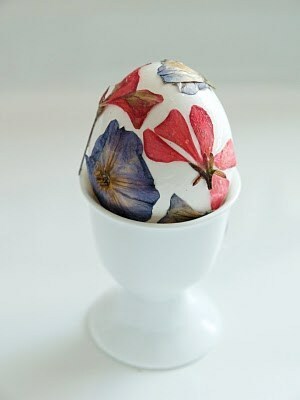 Grab some flowers and leaves and make a pressed flower Easter egg. As you can see when it comes to Easter and flowers the possibilities are endless. I hope you enjoyed these easy Easter decorating ideas for your home! 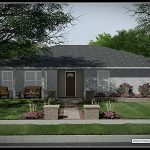 Previous Post: « Backyard Redesign and Remodel Plans + Fire Pit Giveaway!